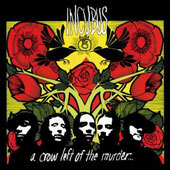 Incubus has a theory that if you make the same album twice you fail, even if everyone likes your album. Thus A Crow Left to the Murder is right on target if changing their sound was the goal. Closer to S.C.I.E.N.C.E. than any other Incubus record, this record will probably leave old-school Incubus fans disappointed, but that really doesn’t mean anything now does it. Sonically, this album is a pretty diverse effort, ranging from energetic garage-rock to an organic mellow Jewel type music. Gone are the silly love ballads which singer Brandon Boyd has replaced with more socially conscious lyrics and poetically complex doting. To his credit, Boyd’s voice is amazing on this record and he has expanded his range and texture immensely, probably with the help of producer Brendan O’Brien. Unfortunately, sometimes A Crow Left of The Murder relies a little too much on Boyd’s vocals and not enough on musical strength. Which is sad for a band that used to perfect such a balance. The first single, Megalomaniac, is a great bridge between previous Incubus efforts and their new musical venture. Additionally, the track sets the social commentary vibe of the rest of the album. If only all the songs on the album were as up beat and passionate as Megalomaniac these guys would have had a sure winner on their hands and Incubus would have created quite a masterpiece. Some of the mellower songs have got to go (like Southern Girl and Made for TV movie), not because they are mellow, simply because they are tired, boring, and nondescript. It’s okay to be more chill but not at the expense of decent listening. On the plus side though, most of the album is upbeat and listenable. Also, this record is the similar to a live jam session rather than a meticulously planned out studio recording, which works in Incubus’ favour. My advice is to prevue the album before you make the investment.